1. To make the sauce, gently warm the cream and chilli in a pan then leave to infuse for 10 minutes. Break the chocolate into a bowl and place on top of a pan of simmering water, making sure the base doesn’t touch the water, and allow to melt slowly while stirring. 2. Strain the warmed cream into the melted chocolate and stir. Discard the chilli. Keep the sauce warm while you make the pancakes. 3. Sift the flour into a large bowl and add the salt and half the sugar. In a separate dish, crack 2 eggs into the milk. Separate the remaining 2 eggs and add the yolks to the milk. 4. Add the buttermilk to the milk and eggs and whisk together. Slowly pour into the flour, whisking gently but being careful not to overmix. 5. In a separate bowl, add the remaining sugar to the egg whites, whisk until light and fluffy then fold into the batter mixture in 2 stages. 6. Heat a little butter and oil in a non-stick pan. Depending on the size of your pan, drop up to 5 large tablespoons of the pancake mix into it and fry each pancake for 40 seconds until bubbles appear on the surface. Flip over and fry for a further 40 seconds, then remove. Repeat in batches with the rest of the batter to make 18-24 pancakes. 7. 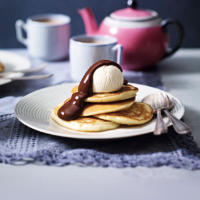 Divide the pancakes between 6 plates and top each with a scoop of ice cream and a drizzle of chocolate sauce. Serve swiftly. If you don’t like chilli but still want a hit of spicy flavour, add a pinch of ground ginger to the chocolate sauce instead.